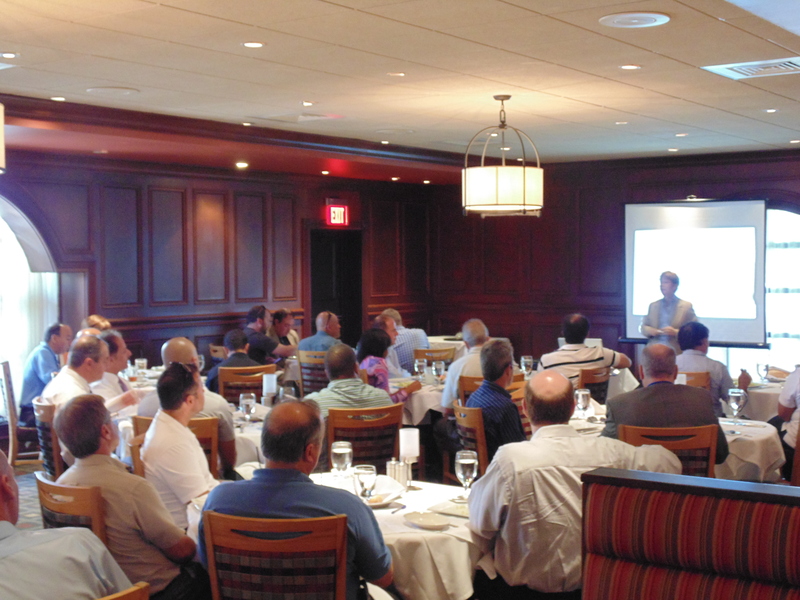 Compliance, Security and Steak- Oh my! 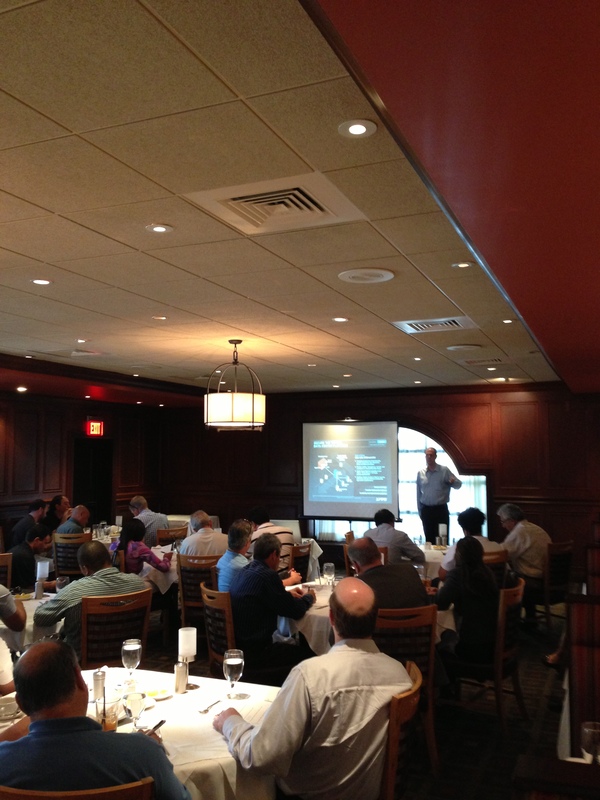 Home › Lunch and Learn › Compliance, Security and Steak- Oh my! 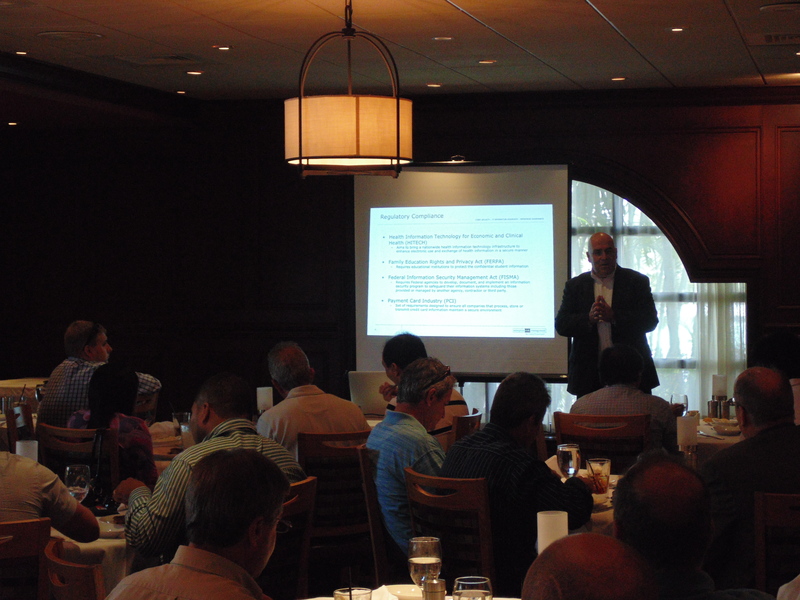 Last Wednesday SLPowers had a Lunch and Learn with Juniper Networks and Enterprise Risk Management at Ruth’s Chris in Ft. Lauderdale. Between the sound of sizzling steaks and the stirring of fresh brewed iced tea, there were presentations on Security and Risk Management. The informative event was attended by many interested in preventing cyber-attacks and keeping up with compliance regulations. Silka Gonzalez of Enterprise Risk Management, which provides clients with comprehensive solutions to the problems that threaten the security of their information assets, informed the attendees about Regulatory Compliance and other related topics. 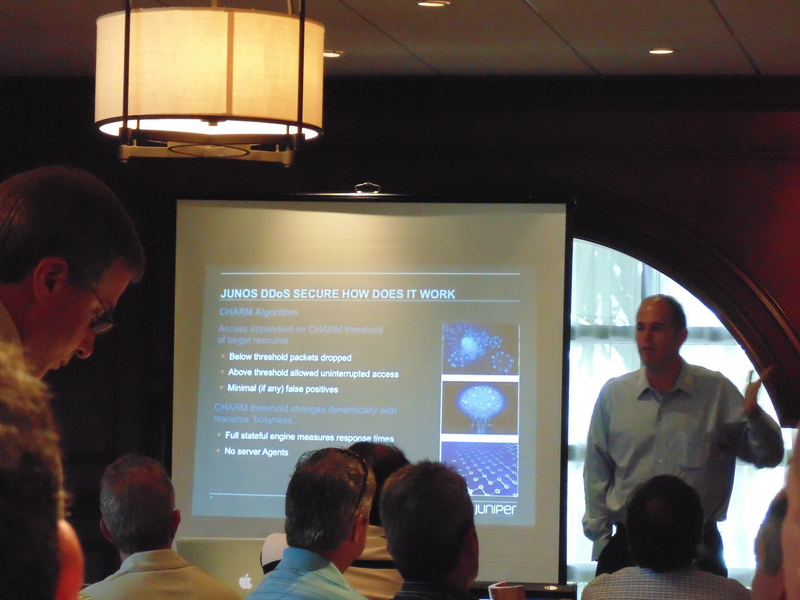 According to Juniper, DDoS flood attacks are a major problem for online businesses. Junos DDoS Secure can nullify these problems by continually monitoring and logging all in- and out-bound Web traffic. Junos DDoS Secure uses its CHARM algorithm to learn which IP addresses can be trusted, and is able to respond intelligently and in real time by dropping suspect or noncompliant packets as soon as the optimum performance from critical resources begins to degrade. This heuristic and granular approach to DDoS mitigation guarantees availability for legitimate users while blocking bad traffic, even under the most extreme attack conditions. Junos Webapp Secure: The innovative Junos WebApp Secure is the first Web Intrusion Deception System that detects, tracks, profiles and prevents hackers in real-time. Junos WebApp Secure inserts detection points into web application code including urls, forms and server files to create a variable minefield. These traps detect hackers when they manipulate the detection points during the reconnaissance phase of the attack, before they can establish an attack vector. And because hackers are manipulating code that has nothing to do with the website or web application, the malicious action is certain. The tracking techniques allow us to profile the attacker and record the attack. Every attacker is assigned a name, and each incident is recorded along with a threat level based on their intent and skill. Once an attack has been detected, an appropriate response—from a warning, to requiring a CAPTCHA, to blocking a user or forcing them to logout, can be deployed manually or automatically in real-time. If you are interested in attending a Lunch and Learn, email avantonder@slpowers.com for more information. You can also check us out and connect with us on Facebook, LinkedIn and Twitter!